Allow me to provide you with a more descriptive analysis of the term “crystallization”. The term “crystallization” is defined as the process by which a substance takes the form of a crystal structure. Most minerals are crystal shaped. The term “re-crystallization” implies that a substance has been crystallized a second time. In other words, changed from one crystal shape to another. In geology, re-crystallization takes place under great pressure at high temperatures deep in the earth and over thousands of years. 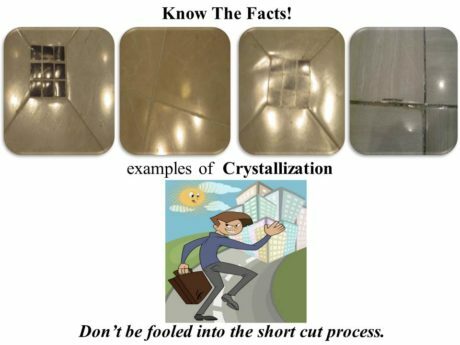 My research showed that the natural recrystallization of minerals such as those found in stone is unlikely to be obtained with the so-called packaged chemical “re-crystallization method” being marketed by a number of companies. We can therefore assume that the term “re-crystallization” is used only as a marketing term. For the purpose of this article, we will use this term, “re-crystallization”, only as a description of the chemical process that follows. I obtained Material Safety Data Sheets (required by OSHA for all chemical products) from a good sample of “re-crystallization” product distributors. From them, it was learned that all the re-crystallization products contained a fluorosilicate compound. All contained an acid of one type or another and almost all contained varying percentages of waxes and acrylics. When an acid is dropped on marble it will burn and etch the surface leaving a pitted, dull spot. The reaction (Formula 1) illustrates what happens when an acid and marble come in contact with one another. The bond between the calcium and the carbonate is broken, producing water and carbon dioxide gas and the calcium carbonate is destroyed. In other words, acid destroys marble. All re-crystallization fluid contains acid. If you have any doubts, place a drop of re-crystallization fluid on a piece of marble, wait just 30 seconds and wipe it off. You will find that it has etched. break apart and rot. The results of these studies can be found in the book Stone Decay and Conservation written by Glovanni G Amoroso and Vasco Passins—ELSEVIER, Amsterdam, Lausanne, Oxford, New York 1983. (Reaction 1). This reaction destroys the calcium carbonate and releases the calcium ion. The fluorosilicate compound then attaches itself to the calcium ion forming a new compound (Reaction 2 & 3). This new compound, calcium fluorosilicate forms an imperious film on the surface of the stone, totally blocking its pores. Marble and Stone FACT: Marble and stone must breathe (transpire). If the pores are blocked, moisture from the slab (condensation, etc.) will be trapped and the stone will begin to break down. Re-crystallization FACT: All crystallization fluid contains acid. In our next update we will provide some pictures of floors that we have discovered that were damaged by this “crystallization” process. Tags: Plano | Dallas marble polishing, sealing, travertine polishing This entry was posted on Monday, May 11th, 2009 and is filed under How To Choose A Stone Restoration Company . You can follow any responses to this entry through the RSS 2.0 feed. Both comments and pings are currently closed.